Scroll down for sign-up form. The Radio Reading Service helps print-impaired individuals access printed information through radio. 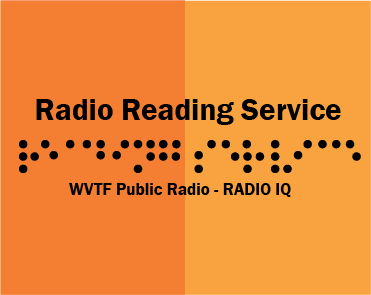 A public service of WVTF RADIO IQ and the Virginia Tech Foundation, the RRS broadcasts continuous readings from current newspapers, magazines, and books on our FM-SCA (subcarrier) channel. The RRS and WVTF RADIO IQ broadcast simultaneously. Who does the RRS serve? At least 1% of all individuals in our listening area have some type of print disability. Sight difficulties cover a wide spectrum that range from total blindness to the inability to distinguish standard newsprint without a magnifying device. Individuals who have a physical condition (such as a stroke), that makes holding a book or turning a page difficult or impossible, are eligible for our services. The RRS also serves individuals who are dyslexic. How does the RRS work? The RRS operates on the subcarrier of WVTF. Listeners must have a pre-tuned SCA (Subsidiary Communications Authorization) receiver to pick up the closed circuit broadcast, which is provided free of charge by New Vision (formerly Voice of the Blue Ridge). Reading of books or magazines - scheduled on a case by case basis.